Lay the sunshade out with the notched side toward you. Cut the Velcro into three pieces, each about 4 cm. or 1 ? inches long. Stick or sew one half of each piece, evenly spaced, onto the edge to the left of the notch. (Sewing these on a sewing machine will cut through the reflective material, so sticking is better.) Attach the matching half of each piece onto the underneath size to the right of the notch, so that they fit together when the two sides are brought together to form a funnel. If using stick-on Velcro, you can align the two pieces easily like this: Stick down one side of the Velcro, then press the two pieces of Velcro together, fold the shade into the funnel shape and stick down the second side. Press the Velcro pieces together, and set the funnel on top of a bucket or a round or rectangular plastic wastebasket. Place a black pot on top of a square cake rack, placed inside a plastic baking bag. A standard size rack in the U.S. is 25 cm. (10 in.). 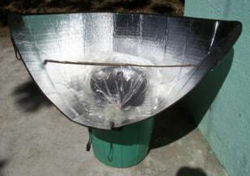 This is placed inside the funnel, so that the rack rests on the top edges of the bucket or wastebasket. 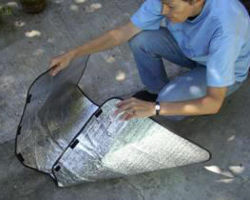 Since the sunshade material is soft and flexible, the rack is necessary to support the pot. 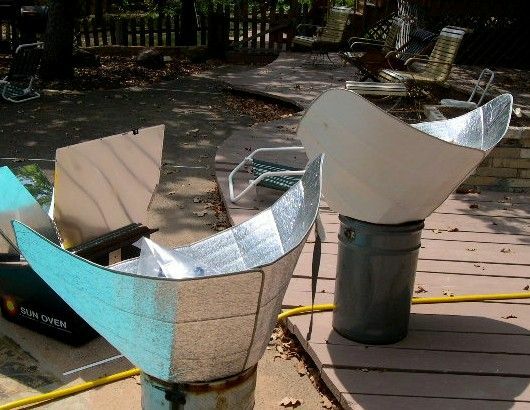 It also allows the suns rays to shine down under the pot and reflect on all sides. If such a rack is not available, a wire frame could be made to work as well. Note: The flexible material will squash down around the sides of the rack. and slip the elastic bands in place for easy travel or storage.The oven will heat up to about 350 degrees F.